The plan writers identified major pressures to be sedimentation, soil erosion and pollution transport, as do the riparian farmers in the area. This not only impacts the Wroxall waterbody, but the downstream Eastern Yar. The Wroxall Stream also currently fails to achieve good Ecological Status because of a proliferation of vegetation – in particular Himalayan Balsam which is causing excessive shading and bankside erosion. The objective of this project is to install some small farm scale wetlands for water treatment (Rural SuDS) to help farm scale treatment of phosphate. Flow path mapping and field survey identifies the best locations for this. The design of the wetlands could help to deal with some of the sediment issues. This part of the project is being delivered by Hampshire and IW Wildlife Trust. 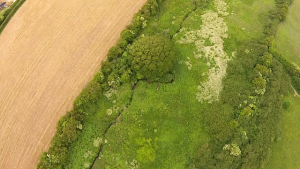 The project will also include some tree-lightening and vegetation management linked to the Water Framework Directive mitigation measures. This part of the project is being delivered by Natural Enterprise.